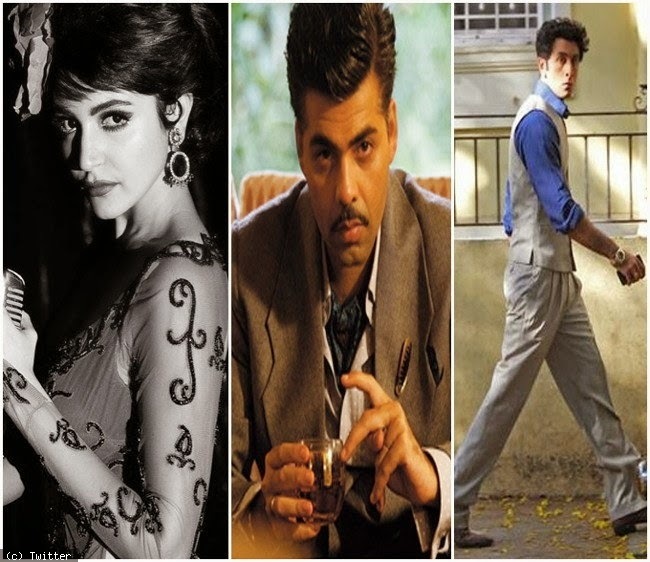 Recently released two movies Piku and Bombay velvet remain under discussion for two reasons. One the love birds Ranbir and Deepika, second who made to hit list and did more business. Ultimately Deepu I mean PIKU won the race here and he left his beloved friend behind. The movie " Bombay Velvet" has a classical touch with jazz music and cabret club culture of ate 60s and early 70's in India. 2 years after separation of India and Pakistan, Balraj came to Bombay with his so called mother, on a port Balraj and his mother luring around to find some work but destiny brings his mother to a brothel. Balraj saw chimman picking a foreigners pocket and here the story starts. They grew together and do the tasks together. One day Balraj and Chimman watched a James Cagney movie in cinema and the ending lines became his motto of life. He wanted to be a “Big Shot” and the wish to be one dragged his life to the climax. Ranbir as Jhonny Balraj, the name given to him after Kaizad Khambata found him suitable for his big Plan, made him a Big shot and used him for his purposes. But Johnny wanted something more. We cannot deny Anushka’s outstanding performance and the moment she performed on stage when Johnny was mad at her; the track “Dhadaam Dhadaam” (sung by Neeti Mohan); and he was planning to assassinate her. True love wins and he himself saves Rosie (anushka). It is the story of small goons turning into gangsters and manipulated by Capitalists of those times. Khambata and Jimmy Mistry (editor of a daily) are actually trying to get ball in their courts. Khambata ( Karan Johar) as villain gave a new image of him but one question popped in my mind at one scene, what was the need to flaunt Khambata’s hairy legs in movie? Trust me they were very hideous and not seductive at all. It was his first movie as a main role and he opted negative role for the official acting debut. The real bone of contention between the two is the growing real estate market of Bombay as both of them want it to be governed as per different ideologies. However, the film lacks any commitment to any type of ideology and all efforts on the director’s part to make it sound like an ideological war just looks very forced. Bombay Velvet’s first impression on me was a movie like American Hustle, with Whiplash’s background score, and a classic movie telling us about the late 60’s India. I found it entertaining and Anurag Kashyap did to some extent well with the script. What I have assumed now that Anushka is a very fine actress and grooming more with the time. She has become choosy about the script and it is evident on screen. You will find classic kind of jazz club music in this movie with very instrumentally composed numbers. Lyrics and music composition is very phenomenal and a person who has some know-how of jazz music and instruments will enjoy the music. Ravishing Raveena while performing in club for “Muhabbat Buri Beemari” will steal your heart for her appearance, so she did mine. Well an inspiring gangster fails to be a Big Shot which was his dream but his journey to be one is very entertaining. First half is full of curiosity and will keep you stick to the movie. The Heartbroken Rosie ends her dream of being a singer and is left alone when her lover Balraj dies in a gunshot. It’s a mix kind of movie, political ideology, club culture, capitalists vs. Communists and amid this all mess a simple love story of Balraj and Rosie, which remain incomplete and rosier Rosie spends her life in the name of Balraj’s love. Bombay Velvet has a lot to entertain you, from Ranbir's underground street fights to Anushka's glamorous club performances. Romance, envy, rights, liberty, deceit and dreams for being a Big Shot and living a life with your beloved. My verdict on movie is that it is a good movie for the sake of entertainment; although some are disappointed because it was little bit dragged in the end. Bombay Velvet is directed by Anurag Kashyap based on Gyan Prakash’s book Mumbai Fables. The main casts has Ranbir Kapoor, Anushka Sharma, Karan Johar, Satyadeep Misra and others. Music director is Ankit Tevari and story by Gyan Prakash and Anurag kashyap. Movie did not get a good response but Anurag posted on social media that he will not stop making films.